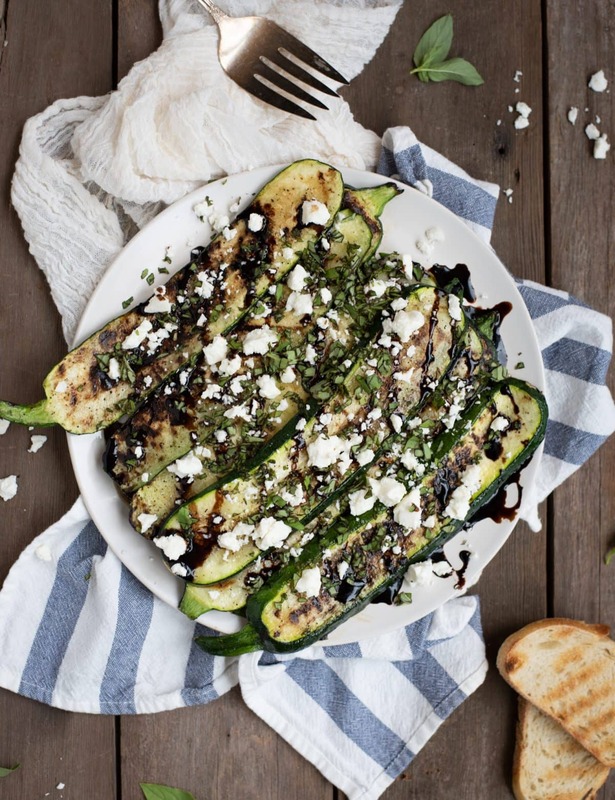 Grilled zucchini with balsamic glaze, basil, and feta sprinkled on top just might be your new favorite BBQ side dish! 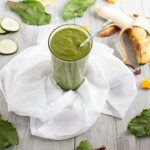 Its light, easy, healthy, & delicious! I’ve finally decided to learn to grill. Although I truly love that my husband does all of our BBQing, the feminist in me hates being such a stereotypical cliché that I can barely light the grill without his help. Its a sad reality in our house. So, I’ve made it my mission this summer to learn. I have yet to singe a single hair so I’m considering it a success, but I still have a lot to learn. 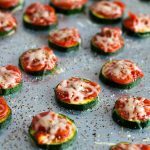 I created this recipe on a whim last summer with our garden zucchini but didn’t get around to sharing it until now. 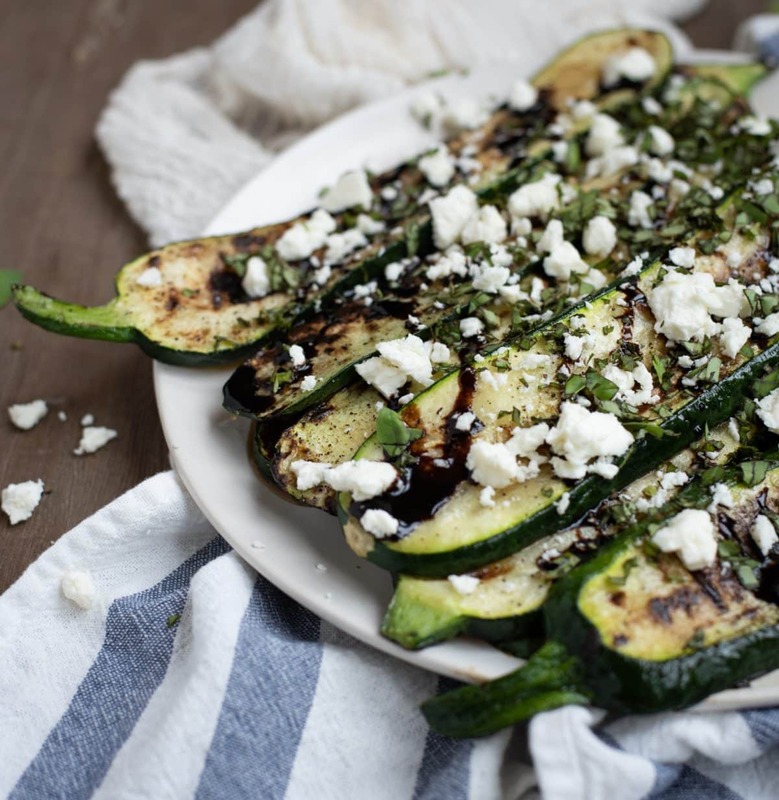 For all you gardeners out there, zucchini should be popping up any day now so its the perfect time to get some new grilled zucchini recipes on your radar! This grilled zucchini is the recipe you’ll memorize for its simplicity and utterly delicious flavor. You’ll make it again and again cause its that good. 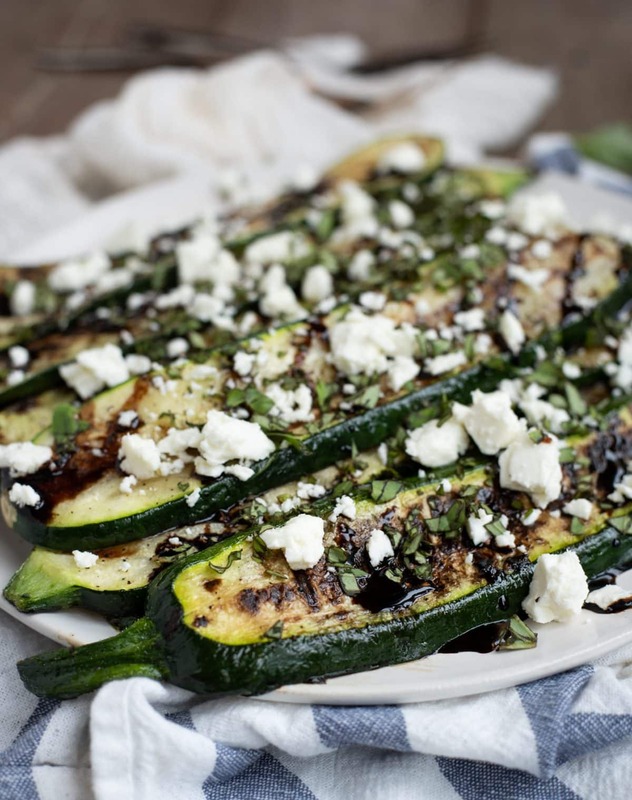 The freshness of the basil, saltiness of the feta, and rich balsamic glaze adds a touch of tartness and sweetness that ties it all together. I love having a BBQ side dish that is actually grilled too. 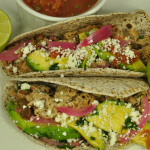 When the grill is already hot, might as well use it and not let those coals go to waste! Don’t get me wrong, I love a good pasta salad as much as the next girl, but there’s something about that smokiness on veggies that makes my tastebuds swoon. A bit of smoke just adds such a unique depth of flavor to any dish. The best part? You don’t need to make your own glaze. I include instructions for this in the recipe card below but for the love of everything holy, just buy some balsamic glaze already! I love the Trader Joe’s brand, and linked to it on Amazon above to show you the one I use, but its only about $3 at Trader Joe’s in store so don’t actually order it online. That’s highway robbery. There are tons of other good brands too so just get whatever looks best to you. I love keeping a bottled glaze on hand for quick Caprese salads, watermelon mint appetizers or to add a pop of flavor to just about anything really. The above zucchini are store bought but still huge and beautiful like garden zucchini. The big (but not huge) ones really work best for grilling since you need to do pretty thick slices. These ones were about the size of my forearm. Considering that I’m a 5’4″ female not a burly wrestler, this is about the size you should shoot for. 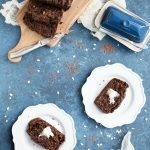 Those absolutely ginormous zucchini that you get when you haven’t checked the garden in a few days need to be made into chocolate zucchini banana bread, zucchini cakes or something like that where they’re shredded into oblivion. 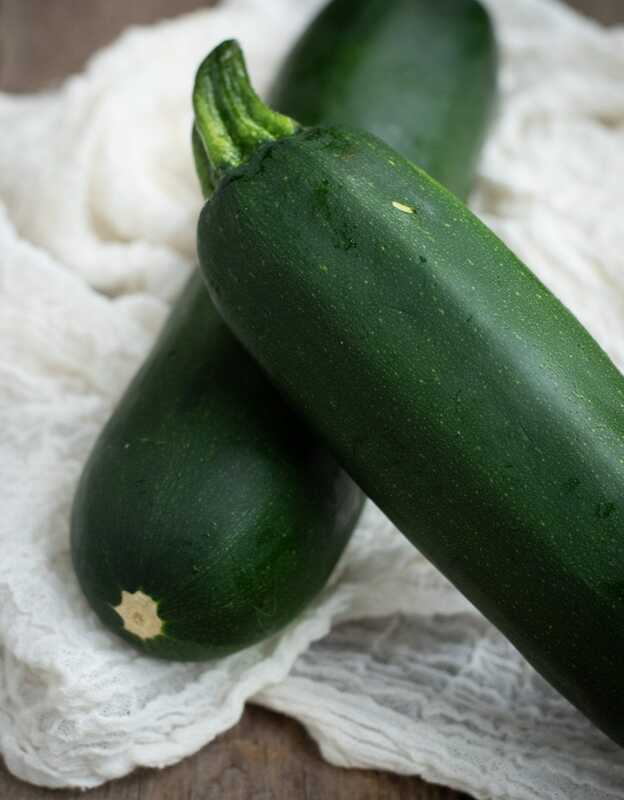 Luckily, there are no shortage of zucchini recipes on this site (and the rest of the internet) so I have faith that you’ll find a good one for those zukes that end up being the size of a small child. This just isn’t it. One other thing to note: oiling the grill is important! Being a new griller, this wasn’t immediately obvious to me and the first batch I made stuck quite a bit. Just use a grill brush and oil that puppy up. It takes less than a minute and saves you from needing to peel scorching hot grilled zucchini off the grate, which is no fun at all. Also, you’ll get the best results if you use fresh basil and good quality feta and vinegar. I feel the need to point that out after getting comments about recipes not working that we’ve figured out were due to using crappy vinegar or other subpar ingredients. 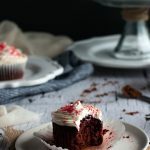 Remember that your final product will only be as good as the ingredients you use in all cases, but especially with fresh recipes like this that really showcase whatever you’re using. 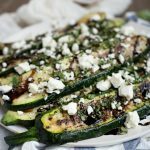 This grilled zucchini recipe really is a pleaser and has been instantly devoured anytime I’ve served it. The recipe makes enough for four generous side dish servings but if you want to make this a bigger BBQ side to serve the masses, just note the size of your grill since you might have to do it in two or more batches. Its best piping hot but I find myself still picking at it once it reaches room temp. too. I’m also a shameless scavenger and do this to most food though so take that into consideration. 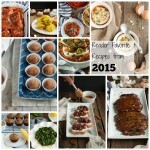 Either way, this is truly the king of BBQ side dishes so don’t let another summer go by without adding this to your regular round up of BBQ recipes. You won’t regret it! 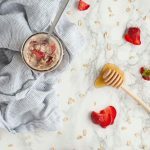 I’ve been thinking about posting some non-food (travel, garden, and even some baby/home guides). Anyone interested in that or do you just come here for the food? I won’t be offended either way, just curious! Drop me a comment below or shoot me a message on here or Instagram to let me know! Bring grill up to medium heat. Lightly oil the grill grates with a grill brush to keep zucchini from sticking. Spray zucchini slices with cooking spray on each side (or rub with oil if preferred). Sprinkle lightly with salt and pepper. While grill is coming to temperature, start preparing glaze by heating vinegar and sugar in a small pan over medium heat, whisking to dissolve sugar. Bring to a simmer, then reduce heat to low. Let simmer, stirring occasionally until vinegar has reduced by about half and sauce coats a spoon (about 10 minutes). It will continue to thicken as it cools so don't over do it! 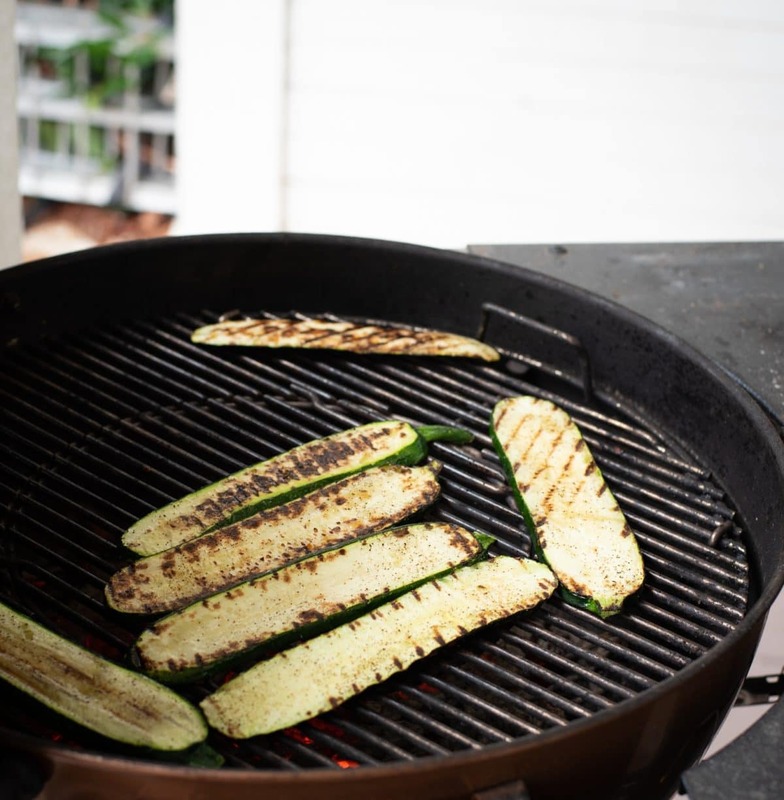 While sauce is reducing, lay zucchini slices out flat on the grill and cook with grill covered for about 3-5 minutes. Flip and cook for about 3-4 minutes on the other side (exact cooking time will depend on temperature of grill, placement, and thickness of zucchini). 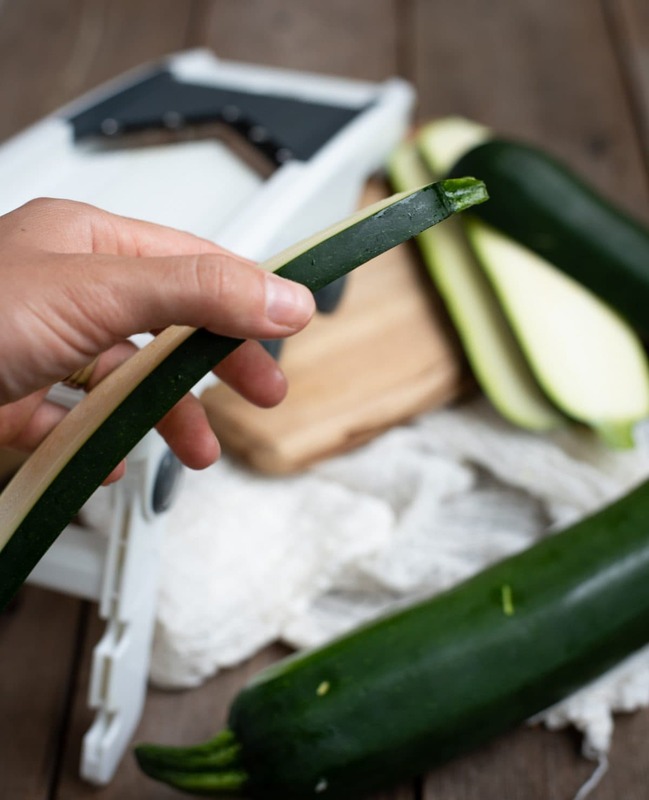 Remove zucchini from grill and spread out, slightly overlapping on a serving plate. 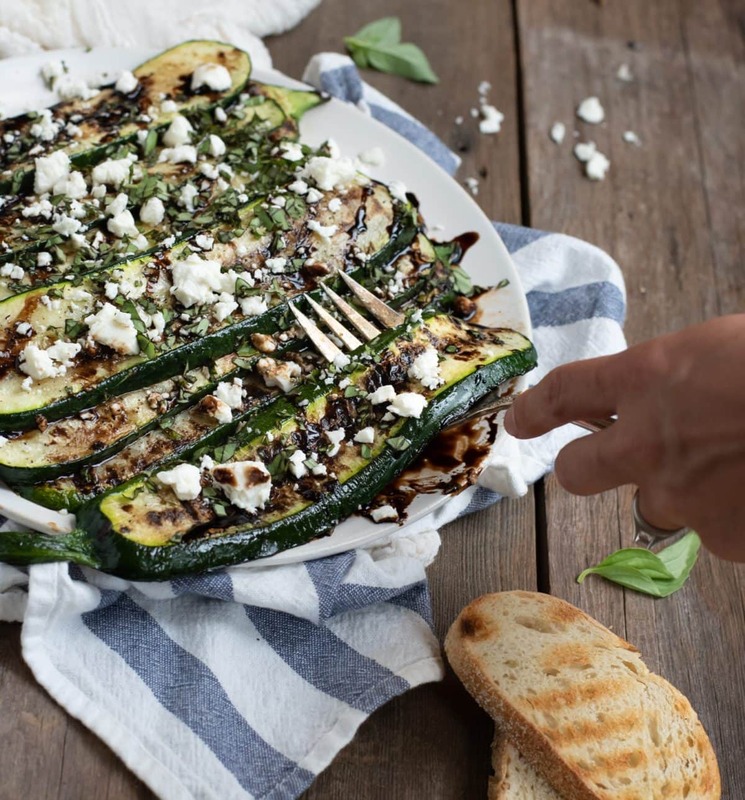 Drizzle glaze over zucchini and then sprinkle with chopped basil and feta. Serve immediately. *To make this recipe even easier, you can skip making the glaze yourself and you a store bought glaze instead. I get this one from Trader Joe's. 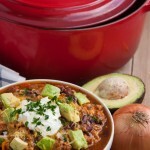 **If sauce becomes too thick to pour, rewarm adding a small amount of water to thin it out. This was delicious. I put the glaze over grilled chicken as well as the zucchini. My wife loved it also. Keep up the good work.